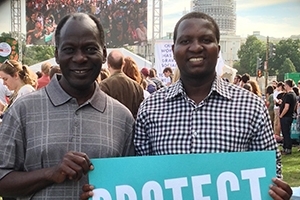 Kamana (right) on the National Mall for the Pope's visit to the Capitol Building. When Didace Kamana went to the National Mall last week, he didn’t wear his collar. He stood amongst thousands of people, many of them tearful as Pope Francis spoke from the Capitol Building. Both a Catholic priest and first-year graduate student in AU’s International Peace & Conflict Resolution program, Kamana found the experience profoundly moving. Originally from Rwanda, Kamana came to AU this year after finishing a master’s in theology at Chicago’s Catholic Theological Union. In his seventh year as a priest, Kamana’s arrival at AU coincided perfectly with the pope’s historic first visit to the United States. Dozens of other AU students attended the papal events in Washington, D.C.—from the Holy Father’s congressional address and White House welcome ceremony to mass at the nearby Catholic University of America, which Kamana also participated in. Given his background and vocation, Kamana drew unique insight from the pope's words. That openness to dialogue is exactly what brought Kamana to AU in the first place. He’s hoping to enhance his biblical studies with what will help him address conflict at a national and international level. Kamana’s commitment to peace and reconciliation stems from a violent childhood spent in his native Rwanda. As a boy of 10 years old, he saw first-hand the horrors of ethnic cleansing and war—particularly when it touched his own home. With that in mind, he’s focused on ending conflict in the Middle East as well as other parts of Africa. He hopes that being at an international institution such as AU will expand his ability to serve other cultures and people. In fact, he appreciates the new perspective away from seminary. Looking ahead, Kamana plans to see Pope Francis again next year, this time in Poland for World Youth Day. For now, however, he feels a moral imperative to change the world through the knowledge he’s gaining at AU's School of International Service. Whether as a priest, diplomat, or both, he believes he will make a difference—with or without his collar on.